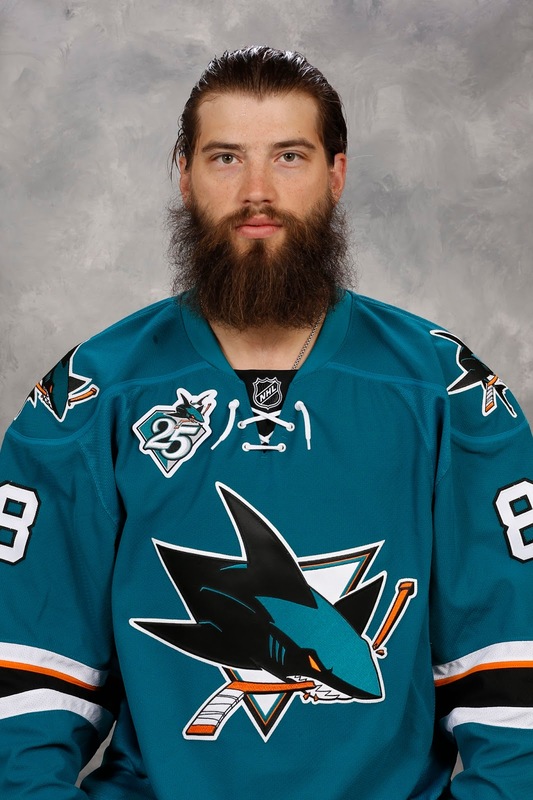 With his unwieldy black beard and eccentric fashion style, NHL all-star Brent Burns is usually the guy that makes others stand up and take notice. 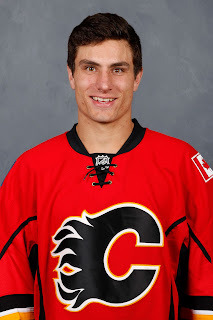 Monday night in the Flames 2-1 loss to the Sharks, it was Flames rookie Garnet Hathaway, who made Burns stand up and take notice. Burns, the 12-year veteran of 780 NHL games, was introduced to the energetic Flames right winger in the second period during a fierce one-on-battle near the Sharks net that resulted in the defenceman raking his stick across Hathaway's face, bloodying up his nose. "I felt bad for the high stick. We came off the boards bouncing and he had good body position on me. He was jamming on the net so I was trying to get his stick," said Burns. " I don’t know if he moved it or he kind of got out of the way, but I high-sticked him right in the head. I didn’t mean to. He took a run at me after, but it’s hockey. That stuff happens." Leaking a little blood wasn't about to stop Hathaway from settling up with the giant 6-foot-5, 230-pound wookie known as Chewbacca. In the ensuing scrum, he pulled Burns out of the pile and the two dropped the gloves for Hathaway's first NHL fight. Blood on the face, some prolonged and intense grappling, a few punches thrown too. The heated exchange would have been a welcome addition to the undercard of UFC 196 on Saturday. "A rebound came, he got his stick up a little bit. Got me in the nose. Once the whistle blew, he kept going. That's just hockey," said Hathaway, who has racked up 23 penalty minutes in his eight days in the NHL. It was a culmination of a spirited night's work for the 24-year-old, who packed a helluva lot of action into his 14 shifts and 8:05 of ice time. Playing on a line with Mikael Backlund and Micheal Ferland, Hathaway had two shots on goal. In the first period he sprung Ferland in alone via a perfect pass from the sideboards. He also delivered two more hits to give him 21 in five games. Oh, and he drew a wheelbarrow full of penalties. His hustle forced Joe Thornton into an interference penalty 5:39 into the first. His determined forecheck led to Brenden Dillon's tripping penalty at 15:03 of the first. More dogged puck pursuit resulted in a lid-removing high-sticking penalty by Paul Martin 3:58 into the second. Lastly came the Burns double-minor for high-sticking at 8:03 of the second. All of that was crammed into the first half of the game. "I'm just trying to agitate the other team a little bit and tonight it worked and we got some power plays out of it," said Hathaway, who unfortunately for him ended up sitting out for the next 17 minutes after the Burns exchange, getting an instigator minor, fighting major and 10-minute misconduct. Mind you, some time in the dressing room was coming anyway to get the gash on his nose repaired. "What did he draw, five penalties tonight? He plays hard. Those are guys that you want on your team and he did his job," said Burns. In his first game at the Scotiabank Saddledome, Hathaway says what fans saw last night is what you get from the guy wearing jersey No. 64, which fittingly is more commonly found on the back of a NFL linebacker than a NHL forward. "A lot of my game is going hard and making the D go back in their own zone, turn their back and go for the puck. If I can get on them quick and if I hit them once then they're going to be thinking about it the next time and hopefully mess up. That's a big part of my game." Bob Hartley says he's been impressed with how well Hathaway has transitioned into the line-up. "I really like the push that he has in his game. He's eager to learn. 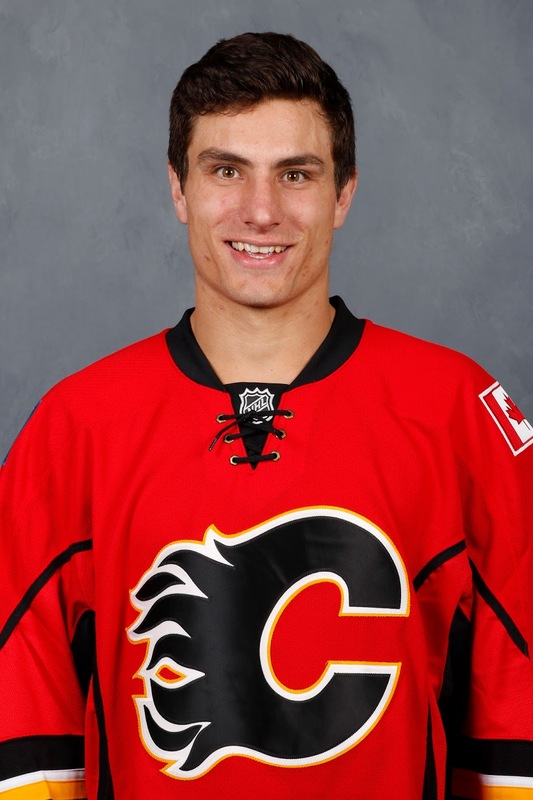 He's so happy to be here and it's nice to see," said the Flames coach. "Our coaches in Stockton have done a wonderful job with Garnet and he's coming in here and he's making a name for himself. Hard-nosed player, up and down, drives his wing and he's very reliable defensively." In an organization where right-shooting right wingers is a barren wasteland, there is genuine opportunity for Hathaway to land a job with this team in 2016-17, regardless of how the draft unfolds or who might arrive in Calgary this summer via free agency or trade. With Johnny Gaudreau and Sean Monahan due for hefty pay hikes, Mark Giordano's new contract kicking in, and a bunch of cash needing to be reserved for goaltenders, Hathaway's economical $690,000 AAV contract for next year would be an ideal financial fit. "He's stepped in and been awesome," said Joe Colborne. "Even in training camp we all were very impressed by his work ethic. He's a hard-nosed player and we give him a lot of credit for standing up for himself there and going against Burnzie, who is a big dude and strong." Thanks to Hollywood, stereotypes that come to mind when you think of an Ivy League college student are quiet, studious, argyle vests and if into sports, it's probably the rowing club. Yeah, not so much for the graduate of Brown University in Rhode Island. A rugged 6-foot-2 and 208 pounds, Hathaway is full of piss 'n vinegar on the ice. He zips up and down his wing like a bull in a china shop. His game isn't complicated, but it's been damn effective. When Hathaway was the Stockton forward summoned last week after the trading away of Jiri Hudler and David Jones left the Flames with just 11 forwards, some fans raised their eyebrows. Why this guy? Why bring up a plugger, who was ninth on Stockton in scoring? What not Freddie Hamilton or Kenny Agostino? He hasn't wasted anytime demonstrating why the AHL coaching staff was so fond of him and why Calgary made him the first of their four CBA-restricted post-trade deadline recalls. "He's everything a coach would like to have in the line-up, said Heat coach Ryan Huska earlier in the season." He works his very best every day, he puts his body on the line every day and he can be a guy that can be used in a lot of different ways whether that's playing a top-six role or a bottom-six role." Last July at Flames development camp when I had an enjoyable chat with the personable native of Kennebunkport, Maine, for this feature, he talked about the work ethic that was instilled in him as a kid. "I don't want to say entrepreneurs are the hardest working people but for me, growing up as a child, my Dad was working the whole time," said Hathaway. "He was always around and involved in the family but his work ethic was something I always strive to compare myself too, even still still today as he runs his own lobster processing business. The guy gets up before the sun is up every day and he's back home after the sun goes down." In college, he studied Business Entrepreneurship and E-Commerce and in a now famous story, he got some real life education when he started up his own lobster roll cart business. It's been rewarded alright in the form of an NHL paycheque for what will surely be the final six weeks of the season, and in the form of praise from one of the league's elite players. Not a bad first week, kid.